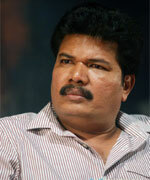 S. Shankar is an Indian film director and producer. He often makes movies that have social themes with a commercial narration. He is credited with delivering expensive, high end CGI in most of his films. He basically comes from the Chennai Film Industry and makes movies in Tamil language. His films are often dubbed into other Indian languages like Hindi and Telugu. Shankar initially worked as an assistant director to S. A. Chandrasekhar. He started his career with Gentleman which grossed very well, then followed by Kadhalan, Indian, Jeans and Mudhalvan which were all mega-blockbusters. He also remade Mudhalvan in Hindi as Nayak: The Real Hero. His next film Boys was a musical blockbuster but grossed moderately in Tamil and Telugu. His film Anniyan, a psychological thriller, was a very huge blockbuster hit in Tamil and Telugu languages. In 2007, he directed and released Sivaji: The Boss with Rajinikanth in the lead role which was an Indian record breaker for the sale of tickets and international popularity, becoming the highest ever grossing film of the Indian film industry by grossing $98 million worldwide. He is currently working with Rajinikanth and Aishwarya Rai again, after Sivaji and Jeans respectively, for the film Endhiran which is expected to be released in 2010. Many of his movies, such as Gentleman and Anniyan, has the protagonist, be played by a Brahmin. However, in recent interviews, he has stated, that it has to do more with the physique of a Brahmin, rather than singling out a specific caste.